The elegant Hollandia 700 is ideally integrated into the roof liner so that you can't distinguish it from a factory-fitted roof. 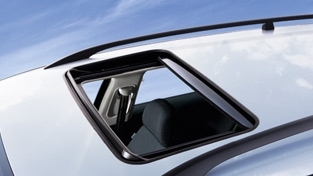 When closed, the tilt and slide roof harmonises perfectly with the car. When open, it disappears discreetly into the roof lining. The sunblind matches the inside of the car perfectly with its elegant design looks. Webasto Hollandia 700 Series Quality and fit in an OEM look. The Webasto Hollandia 700 pop-up / sliding roof.